It was inevitable. 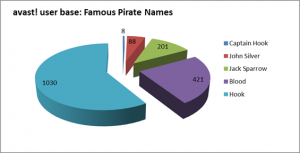 With over 130 million registered users, we were going to get some pirate names in our database. We just were surprised to discover that these pirates are such a large – and creative – crew. Currently, we have some 3,000 self-styled pirate captains in our database including Jack Sparrow, John Silver, and Captain Hook. And that's before we started "Pirate Talk" and our www.avast.com/lp-talk-like-a-pirate micro-page. From a literary perspective, Disney’s Pirates of the Caribbean films are a much bigger attraction than Robert Louis Stevenson’s Treasure Island. We have 201 Jack Sparrows compared to only 88 John Silvers. I won't comment on Long. With 421 users registered under the “blood“ name, we can say that blood and gore is a continuing attraction. By far the most popular pirate name is Hook with over 1,000 registrations. But except for those eight people that named themselves Captain Hook, we think that these might be real Hooks. The most creative of this motley crew gave themselves a pirate name AND registered their location as the Cayman Islands, Turks & Caicos Islands, Vanuatu, Gibraltar and Tonga. I am impressed.